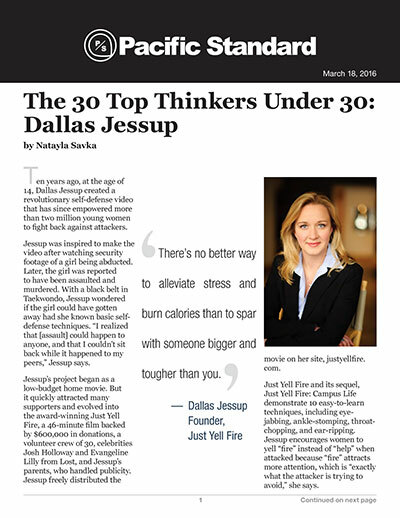 Ten years ago, at the age of 14, Dallas Jessup created a revolutionary self-defense video that has since empowered more than two million young women to fight back against attackers. Jessup was inspired to make the video after watching security footage of a girl being abducted. Later, the girl was reported to have been assaulted and murdered. With a black belt in Taekwondo, Jessup wondered if the girl could have gotten away had she known basic self-defense techniques. “I realized that [assault] could happen to anyone, and that I couldn’t sit back while it happened to my peers,” Jessup says. Jessup’s project began as a low-budget home movie. But it quickly attracted many supporters and evolved into the award-winning Just Yell Fire, a 46-minute film backed by $600,000 in donations, a volunteer crew of 30, celebrities Josh Holloway and Evangeline Lilly from Lost, and Jessup’s parents, who handled publicity. Jessup freely distributed the movie on her site, justyellfire.com. Just Yell Fire and its sequel, Just Yell Fire: Campus Life demonstrate 10 easy-to-learn techniques, including eye-jabbing, ankle-stomping, throat-chopping, and ear-ripping. Jessup encourages women to yell “fire” instead of “help” when attacked because “fire” attracts more attention, which is “exactly what the attacker is trying to avoid,” she says. Jessup began practicing martial arts at age 10, when she announced to her parents that she wanted to date. Her dad joked that she could date as soon as she earned a black belt. Three years later, Jessup held up her end of the bargain.